Videos are all over Facebook, Instagram, Twitter, Kickstarter, LinkedIn, Amazon, and eventually even apps like Tinder and Etsy will have videos too. Think of this in the 1900s if you didn’t know how to write, you would left with little opportunity. The same thing is happening right now with video, it’s becoming increasingly important to have a basic understanding how to shoot a video. You could be marketing a product, sharing a comedy sketch, trying to increase your job prospects, generating leads, growing your audience, or even connecting with friends and family in your personal account. Video is pivotal in gaining attention on social media. You don’t need to enlist the help of professionals in order to get started, you can make videos yourself and its easier than you’d think. 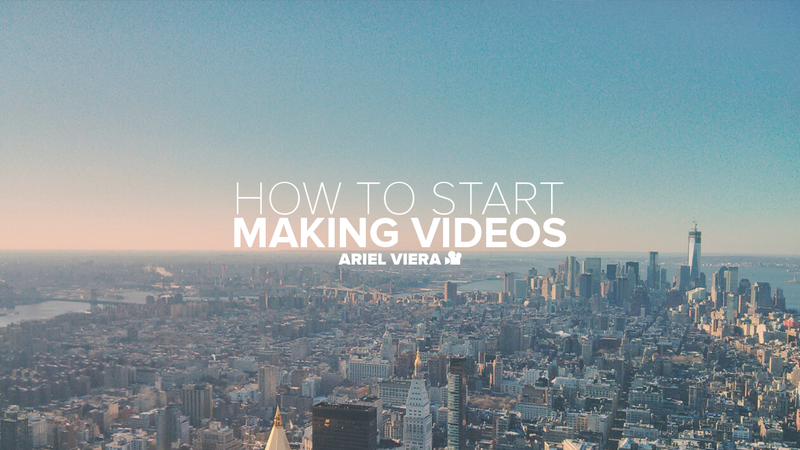 Let’s break down the simple steps to start making videos that help you achieve your goals. Market a specific product. Perhaps you wrote a book, built a blender, constructed a house, crafted an origami swan, or knitted a suit and you want people to buy it. Showcase your craft. Perhaps you’re a painter who wants to show your process, or a comedian sharing your standup, or a photographer that wants showcase their gear, or a carpenter that wants people to see how you build a chair. Any craft can be visualized in video, some may take more creativity than others, but video is great way to showcase your process. Generate Leads. You may want to gain new clients for your business, increase job prospects, or acquire new contracts. Grow your audience. You may want to vlog and gain an audience to follow your daily adventures, or teach people about wellness and health, or grow a community of like-minded individuals fighting for social justic. Sometimes it’s the reach that is most important for some of you initially. That is the case with my channel Urbanist — where I tell the unique stories about cities around the world — I’m mostly focusung on growing my audience as large as possible. The video is the product. You might be building an online course, shooting video for a client, or selling stock footage. Have a goal in mind because that will help inform you on what should be the content of the video. At the very rudimentary level videos are a mode of communication and you have to know what you want to say in order for the message to come across. But what about gear?! That’s right, your smartphone. The number one excuse I hear from people who want to start making videos is that they don’t have the gear or the gear is too expensive. Take out your smartphone right now and hold it. Go on, do it, trust me. Open your camera app and press record. It doesn’t matter where you are — office, outdoors, commuting, bathroom, or a loud concert where you decided to read this medium article — just point your phone in a random direction and record for about 30 seconds. Then play it back. What you’re seeing is footage that is much higher quality than many of the film greats from the mid-twentieth-century had access too. Which means you have a camera with a far higher resolution, smarter sensor, better-quality lens, and a more sensitive microphone than Alfred Hitchcock had access to when filming Vertigo. Mind-blowing isn’t it? So the next time you complain about gear remember that world-class filmmakers used worse technology to make films that are still revered today. Videos on social media tend to be only viewed immediately when they’re posted, after that they tend to just disappear due to the constant uploading of newer videos. The majority of people watch videos on their smartphones that have tiny screens (still not capable of 4K resolution yet) and lower-end headphones. 90% of your viewership won’t be able to tell nor care about the between a video recorded on the iPhone or one recorded on a Sony A7Sii. People care about the story more than they care about the quality. Again, why do people keep watching black-and-white Hitchcock films or watching vlogs filmed with consumer-grade cameras? Use gear that services the story, anything else is superficial. I encourage all of you to start filming with the smartphone that you have right now. But if you are a fan of gear and are eager to buy some here’s a few recommendations to get your started. iPhone 7 Plus: for the very best smartphone for filming, Apple is the way to go. Sennheiser Clip Mic iOS: this is a great mic for your smartphone especially if you’re speaking in crowded areas. Joby GorillaPod + Gritech Clamp Phone Holder: this is the best portable tripod you can buy. insta360 Nano: want to get started on 360 video? This camera is so easy to use. Sony A7sii + Rode VideoMic Pro + SanDisk 128GB SD card: If you have the money to spend and want to shoot 4K right away, then might as well go for the best. Okay, you got your camera. What do you now? If you want people to watch your video — while they have the option to watch countless other videos — then you have to provide immediate value to your audience. It’s the basic law of give-and-take. You must give something in order to ask for something. What will you be giving in your video? Here are a few ideas. Aesthetics: Find the prettiest shot and start recording. This is how I got started on Urbanist, I just started filming pretty neighborhoods in NYC. Education: What can you teach others? Providing your audience with valuable information will get people watching and sharing your video. The information can be anything including how-to guides, restaurant recommendations, life lessons, business tips, etc. Entertainment: You can record a skit, tell a story, shoot a short film, or recount your day in an entertaining way. There’s millions of ways you can entertain. Find the way that best fits your voice. Personal Stories: You can record an interview, tell your personal stories with actionable insights, motivate others by sharing your experiences, or collect other people’s stories. People love people, its simple as that. One of my good group of friends the Nowhere Men have gone viral multiple times collecting the stories of unique people shooting everything with only their iPhone! Record the absolutely simplest version of a video you can make. But, what if you can’t edit?! You heard that right. If you don’t know how to edit, just make a video that you don’t need to edit! Shoot the video in one take or do a livestream. It’s that simple. Make the simplest video you can make. Just press record on your smartphone, point it to your face and say something valuable to your audience. I don’t come from a video background. Never went to film school. Never picked up a camera until a year ago. And yet I was able to get 4M video views on Urbanist in the 11 months I’ve been running it. How? I learned video editing on Youtube. The very basic editing software you can use right on your smartphone is iMovie or Adobe Premiere Clip. You’ll get the hang within 20 minutes of tinkering. However if you want use a professional video editing software like Adobe Premiere Pro (my recommendation since it connects with the Adobe suite), you can learn how to edit within 20 minutes watching a Youtube Tutorial. There’s TONS of tutorials on Youtube for any type of learning style or level of expertise. Okay, so you recorded your video and perhaps even made a nice little edit with titles and music, but what’s next? Post that video! YouTube: longer edited videos. Typically anything longer than 3 minutes is best because the YouTube algorithm favor watch time over views. Facebook: anything goes on Facebook! From short unedited videos, to long-form (10 minutes or more), to live video, to 360 video. When you’re just starting out, I recommend posting on Facebook, where raw content thrives much more. Instagram: The current limit is 1-minute and videos in square ratio tend to look best. Aesthetically-pleasing videos, comedy, and a person talking to the camera work best on Instagram. Twitter: The current limit is 2 minutes and 20 seconds. Twitter videos are especially ephemeral since the timeline is always updating, so videos have to be extra catchy on this platform. On Social Media videos aren’t merely videos, there’s a few other components to consider when posting. Tags help your videos to be found on YouTube and Facebook. Use relevant terms on what is the video about and where it takes place. Comments: Responding to every single comment you can is crucial to building your audience. Social Media platforms thrive on engagement, which in turn means that any video with high engagement is bound to be viewed more. Now take out your smartphone and start making videos! Don’t think too much into it. Stop making excuses. You have the tools. You are able to start creating right at this very moment. I’ll be here posting more articles about making videos to help you along your journey, and there’s an unlimited amount of knowledge to be found online. But first, go and film something! Audiences on social media don’t care about perfection and the only way to get good at something is by practicing and putting your work out there. While you may not become a professional video producer like I am, just learning basic video literacy will help you to gain attention in this video-filled world. Thank you for reading! If you like this post, hit that ❤️ button. It’ll be a huge help in getting others to see this post as well. :) You can also find me on Twitter, Instagram, Facebook. If you’re looking for professional video work or consultation, visit: arielviera.com.